This little meal has become one of my lunch staples. I made a plate for my mom, too, and she kept saying “Kayla, this is soo good!”. I’m glad she approves. 🙂 I do try to eat tasty and healthy meals, you know! 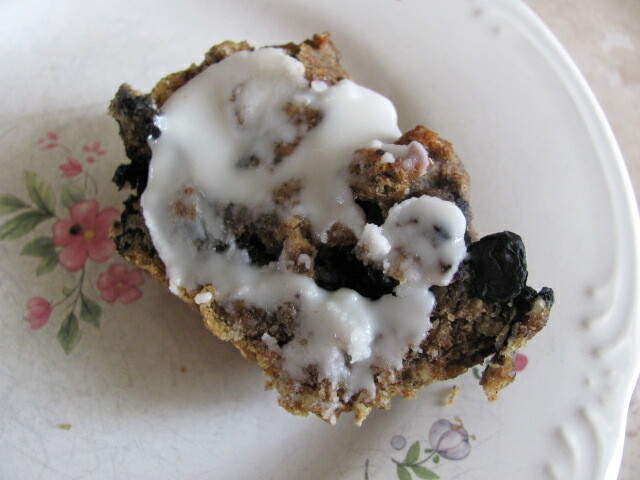 On the side, we split the last blueberry muffin, smeared with Coconut Butter from Artisana. Don’t you just want to gobble it all up? I hope those of you in the snowstorms are surviving! Here, it was actually very warm out today, felt like Spring! I am the most boring dinner person. I think it’s because I’m just too lazy to cook anything when it’s dark out. I’m not a fish and veggie person. I would much rather have oatmeal for dinner or a smoothie. Tonight I had some Brownie Balls and a few dips into the hummus container for dinner. Lame. How was sugar-free week Day 1 for you? What do you eat for dinner, I need ideas? I love making an individual pizza when I am alone. I use a tortilla as the crust and then just load it up. That or a tostada. I love making mexican food healthy! 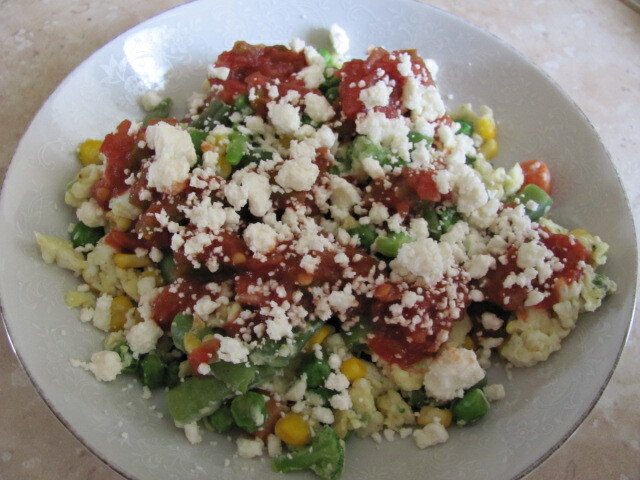 I love eggs, salsa and veggies together… such an easy and filling breakfast or lunch! I have a weird addiction to eggs and salsa. So good. That muffin looks to die for. Mmmm that scramble looks so good…the feta cheese made me drool a little bit. And I do love when moms make the discovery that healthy food is actually “GOOD”… mine does that all the time! Brownie balls, um, yes please!! haha Dinner is my specialty, I have a very hungry boyfriend that gets home from work every night ready for a home cooked meal! We had white chicken chili – I thought it went well with the blizzard blowing over Chicago right now! It is a complete whiteout, the city shut down at like noon today!! I bet that lunch tastes good. I add salsa and feta to just about anything. I also sometimes make something similar to this except I wrap it in a tortilla. Today I had whole wheat pasta with a bolognese sauce for dinner. But your Brownie Balls look like a pretty legit dinner to me! I love pasta or stir-fry as good go-to dinner options, and they’re quick to throw together too! I definitely want to “gobble up” that blueberry muffin with coconut butter. Doesn’t coconut butter make everything better? I may or may not often eat it straight up from the jar. Yummmm! I love that you cook healthy meals for your mom, too. It’s so much fun to share our passion for healthy living with others and teach them that healthy CAN mean delicious! I like Spaghetti Squash for dinner. Ever had it? 🙂 Do you like Lagsana? Pizzas? It’s really great to hear that you’re helping your mom out and that she’s loving all the food you’re making her. 🙂 I sometimes have trouble coming up with dinner ideas too (I’m definitely more of a breakfast and lunch type person) and they can get pretty redundant. A lot of times I’ll just end up heating up veggies and putting them over pasta or rice, or will just throw together a simple sandwich or salad. ahh last night i had half a butternut squash roasted… with scrabled tofu in cinnamon… i topped the squash with the tofu, more cinnamone, almond butter and a little agave and served with some veggies! SUCH A GOOD COMBO!